Mark: Hi, it's Mark Bossert, producer of the Pawlik Automotive Podcast, and we're here with Mr. Bernie Pawlik of Pawlik Automotive in Vancouver, 19-time winners of Best Auto Repair in Vancouver, as voted by their customers. How are you doing this morning, Bernie? Mark: We're talking about a 2018 Subaru Crosstrek. A service, it had a service. What was going on with this almost brand new Subaru? Bernie: I say a service. It's actually an A-level service, which we should have put there to be clear. And it's interesting, because this client, we've actually serviced this vehicle since brand new, now you're thinking 2018, we're in 2019. It may have had its first service but actually this is the fifth service we've done on the vehicle. The owner of this vehicle drives an awful lot. It's got about 48,000 kilometres already on in a year period. He drives a lot. Basically, we do an A-level service, so at our shop an A-level service, basically the heart of it is an oil change, and then a basic maintenance inspection around that. What else is included of course is inspecting lights, inspecting all the fluid levels and qualities, under hood and under car visual inspection, adjusting tire pressures. That's basically that kind of bulk of it. Mark: Was anything else in need of service on this pretty new vehicle? Bernie: No, it actually needed absolutely nothing, so that's always nice and that's the advantage of owning a new car is that you don't need to do anything on it for a while. The owner's good, at least conscientious and changes oil on a regular basis and has it serviced, so that's really the important thing to do. And then when things do crop up, because they will as the vehicle gets older, you fix them as they go. Mark: How often do Crosstreks require service? Bernie: Well, this vehicle here is somewhere in the 10 to 12,000 kilometre range. It uses synthetic oil. This is a perfect candidate for a longer oil change interval. We do his normally at 12,000, around that range. He drives a lot, the engine's hot so that's a good amount of time to do the service. If you were the kind of person who maybe only put 12,000 Ks on a year, it'd probably be better to have it serviced a little frequently because that engine's gonna be running cold a lot more often, and that's harder on the oil than for a car that just runs hot. Mark: And so a lot of people think that only the dealer can service a brand new car, and still have their warranty? Is that true? Bernie: No. We've got a number of clients who buy new vehicles and bring them straight to us for service. They'd rather deal with us than going to the dealer, and there's no effect whatsoever. The key thing is, is that you have to have your receipts or at least be able to access the receipts. We have them all in our computer but it'd be good to keep your own files. Make sure you do the maintenance as scheduled and have documentation. If the engine blows up in this vehicle, he's covered. He's done all the work, he's had the flues changed at the right time, and the service is all done at the proper time. The advantage with us, is if we see an oil leak develop on the vehicle, it might be that the dealer looks at it and goes “It's not enough that we can run it under warranty.” But if you go in and say “Hey, there's an oil leak in this vehicle,” it's been found somewhere else, they're not gonna cover things up. There's actually an advantage because we're not biased in any way. We just call it as we see it. Mark: How do you guys actually do the inspection? How do you log everything? Bernie: Well, let's look at that. One advantage that we have at our shop, a lot of independent shops don't have, and actually even dealers have a ... We have an awesome electronic inspection system that we do. Let's just have a look at, an example of what you, as a client will receive after we do this inspection. This is, as I mentioned, an A-level service. For the A-services, I mentioned it's a more basic inspection. We measure the tire pressures, we adjust the tire pressures, do a visual under hood and under vehicle inspection, look at lights, and that sort of thing. Now, this vehicle, this is actually kind of a boring inspection to look at, but as a customer, this is the kind of inspection you want. There's 45 items that we looked at and they're all okay. Which is, I'll have to say, pretty rare. We don't do these inspections all that often. There's usually always something that needs to be done. But this is basically the sort of ... The basic view that you would get when we send the inspection report to you and we send this out either by email or text message or both. And there's a link and you just open it up and have a look at it. Most of our clients, quite honestly, are blown away by this inspection, just how thorough and how detailed it is. And when there's problems and issues, we take photographs of things. This one here ... I'll just get to the next picture here. And so this is how it expands. You saw there was a little plus button, you can click on it, and go “I kinda wanna see what's going on with it.” Here you can see the windshield wipers. These are some of the things we look at. And I'm not gonna bore you with all the details but the other most interesting inspection to look at, this one here you can see that we take measurements of the tires. The treads are still practically brand new. Adjusted the pressures on the tires. There are notes in certain places that can be clicked on and you can see. But if say there was a ... Say the tires were worn out, we normally take a picture of that so you can actually see the tread wear. It's like you being in the bay yourself and actually having us showing you stuff on the vehicle. It's a really good system and we're proud to use it and our customers love it. Mark: And how are Subaru Crosstreks for reliability? Bernie: Well, they haven't been out for a long time. We actually have not run into any problems with any of them so far, so I'd say it's a fairly new vehicle on the road. I'm sure some issues will crop up, like they do with all vehicles, but they are different in design. They still have the boxer and four-cylinder engine as they've used forever and ever. They always keep redesigning them and changing the format of the engine around. This one uses a timing chain, which they have for quite a few years now. They seem to be a little more reliable. I think the only issue with the timing chain, what we've run into, was there was a leak in one of the ... We had a client with a timing covered gasket leak but that's about it. Head gaskets seem to be pretty solid on these things so far, which is a good thing, compared to the last generation where pretty much every one of them was a guaranteed head gasket replacement. So far, they're holding out well. Mark: So, there you go. If you're looking for service and reliability for your vehicle, if it's a Subaru or any other make or model of vehicle, the guys to see in Vancouver are Pawlik Automotive. You can reach them at 604-327-7112, to book your appointment. Book ahead, they're busy. And if you're outside of Vancouver, in the other part of the country, call your local dealers. We can't diagnose your problems over the phone. It's not in integrity for us to do that. As well, you can check us out on YouTube. Hundreds of videos on there of all makes and models of cars. Pawlik Auto Repair. The website, everything's up on there as well, pawlikautomotive.com. Thank you so much for listening to the podcast, we really appreciate it. Thanks, Bernie. Bernie: Thank you, Mark, and thank you for watching. Mark: Hi, it's Mark Bossert here with Mr. Bernie Pawlik, Pawlik Automotive in Vancouver. 19-time winners of Best Auto Repair in Vancouver, as voted by their customers. We're talking this morning about a truck, a 2001 Chevy Suburban, that had an intermittent no-start problem. How are you doing this morning, Bernie? Mark: What was going on with this rather large, rotund, boat anchor? SUV? Bernie: Well, I add in, actually, this happened to be my own personal vehicle. What was happening is about a month and a half, two months ago, it developed this interesting no-start issue. I pulled into a store, got something, walked out, cranked the engine over. Cranked over fine, but it wouldn’t start. I go, oh, that's weird. It's never done that before. I was a little flustered, and after trying it for a couple of minutes it started up, ran great, and I drove home going, oh, that's kind of weird, and it never gave me a problem for another couple of weeks. So, never gave it much of a problem, and because I'm busy, it's like the classic thing of the shoemaker's kids having their bad shoes. Sometimes, unfortunately, my cars get treated like that. In the case of this vehicle, it kind of went like that. It took about a month and a half, or so before we finally got to the final diagnosis and repair, which we're sharing on this podcast. What happened in between is it just got slowly worse, but it seemed to always be consistent. If the engine was hot and you leave it for a few minutes, it would be hard to start. But, if you left it for a little longer, it would start just fine. That was basically the issue, and it boiled down to being a bad fuel pump, at the end of the day, which was surprising because I'd replaced the fuel pump about three or four years ago with a high-quality pump that wasn't dead. But, I figured, hey, let's get on top of this thing because the vehicle's got pretty high mileage. Let's make sure the pump's good, because they're one of the things that quit on these vehicles, and you don't want to be stranded somewhere. So, finally, eventually, this replacement unit quit, probably a lot sooner than I expected it would. Mark: How did you diagnose that it was the fuel pump, and then how did you verify that the pump was the problem? Bernie: Right. Well, initially, I didn't really ... I figured it was a fuel issue because ... Just by the way that the vehicle was operating. But, it didn't seem, initially, like a fuel pump, because, normally, when a pump dies, it'll do what we just did there. Maybe you might bang the gas tank, or something, to get it going. It doesn't usually restart after a couple of clicks of the key, so I figured maybe there's some kind of weird electronic or electrical glitch with the vehicle. A sensor, perhaps. First step was of course to hook a scan tool up. Scanned it for codes. There was nothing relevant in any sort of way to a no-start issue. Tested some of the sensors like the crank sensor, which is a pretty important input, in terms of starting the engine. It was fine. Figured, possibly, again, because it was an intermittent issue and not happening consistently, I figured maybe there was an issue with the Passlock key. There's a security system on these GM vehicles, and they have to send a signal. When you insert the key and turn it, it sends a signal to the computer to start it or not. It'll do exactly this. It'll crank over, but it won't start. It'll disable the fuel. So, tested out that system pretty thoroughly. It was all good. Again, just kind of in life, it got busy and then, eventually, the vehicle got worse and finally died. Finally, the final straw was banging ... I had an emergency, I had to bang the gas tank with a hammer. It started up. So, okay, that's pretty much a guaranteed diagnosis right there. Mark: Bringing back, flashing back to memories of crawling under this old Volvo I had, that I had to pound on the fuel pump to get it to go. Bernie: Yeah, yeah. Yeah. The reason that works, by the way, if anyone's wondering, is that the pump, it has motor with a ... It's called a commutator. It's got little brushes and eight spots on the motor. When one of them wears, the pump can't turn, but if you bang it ... And it doesn't always work. Sometimes the pump's so dead it won't work. But, sometimes, if you bang it, it just jolts the pump enough to move that little millimetre, or quarter of a millimetre enough, to just get the electricity to flow, and then the pump starts running. Mark: Did you do something else to check that? Bernie: Yeah. The other interesting bit of diagnosis, because I was ... The other one that I use is a lab scope, to look at the actual current ... It's called a current ramp test of the fuel pump. Just to see what was happening with it, because, as I said, I was surprised because the pump wasn't that ... I mean it was like three, four years old. It really shouldn't have died at this early of an age. So, I wanted to see exactly what this looks like, because this is a test we can do sometimes to test people's fuel pumps. And, you know, if someone's got an intermittent issue like this, it's a good way to see, hey, is the fuel pump actually the problem? So, I'll just share some pictures here. We did this with a lab scope. Mark: What is a lab scope? Bernie: So, what is a lab scope? This is basically ... I'll just share the picture here, we can see it. Basically, a lab scope, it's an oscilloscope that attaches either to ... It either takes a voltage or an amperage signal. In this case, we use a current probe, and we actually take a sweep of the actual current that's being drawn through the fuel pump. So, this is with the new fuel. This is the engine running, and this is the current flowing through the fuel pump. So, on one side, we have the voltage being used, and on other side we time-frame. So, you can see, this is 100 milliseconds across here. This is a hundred one-thousandths of a second. So, this is ten one-thousands of a second. So, you can actually calculate the speed that the pump's turning. I'm not going to get into that. It requires a little bit of math, but not a lot. You can see little pumps here. One, two, three, four, five, six ... This is basically a healthy fuel pump. It's got a little bit of a dip. The reason it has these different little pulses is this is where the commutator, which is where the brushes run inside the motor ... This is where they contact. So, there's a change in current flow every time it goes past. Now, this is a good pump. Let's have a look at what a bad pump looks like, the old one. Very hashy. There's some distinct rises here, but there's also very distinct drops. Now, this is a bit unusual for a fuel pump, too, because a lot of current problems with fuel pumps ... You'll often find, if you have a bad fuel pump, the pattern'll actually look like this, except it'll have one or two missing peaks here. That often indicates, oh, there's a commutator that's actually worn off. Whatever was going on in this fuel pump caused a pretty radical spike in voltage. Interestingly enough, when the engine was running, it ran perfectly. But, I think, because these big spikes here required a lot of power to get the pump turning, that's why it wouldn't start. When you're cranking the engine over, the voltage is lower. So, it just didn't quite have enough juice to turn. But, once it was moving, it worked fine. So, that's what we can see with a lab scope. There's many things we test with lab scopes. It can take a little extra time to hook it up, but often it'll verify things. I had someone some in with this concern, and said, hey, I got this intermittent problem, but it only happens once in a blue moon. This is the test we could of done that didn't take a lot of time, that could of verified, you know what, your fuel pump pattern's bad, we should change it. Mark: So, after you replaced the fuel pump, everything ran well? Bernie: Yeah, it started fine, ran well. Perfect. Yeah, really nice. Bernie: We're giving life to the vehicle again. Mark: This is an 18 year-old vehicle now, and it's yours. How does it run overall, and is it worth still keeping it going on the road? Bernie: Yeah, it's really good. I've taken really good care of it, and the engine actually wore out at about 300,000 kilometres, so I replaced it. I put a 6.0L, so it's a slightly larger engine than the 5.3L that came in it. I put a nice, used 6.0L engine in it. It runs great. As I said, I've kept up all the maintenance and repairs on it. When you drive it, it just drives like a brand new truck still. Even the shock absorbers, which surprisingly, they're still original, and I've towed a trailer with it. It's built well. The ride is perfect. It's smooth. The only thing I can complain about, the fuel economy is not great because it's a big beast, but other than that, it's a good vehicle. I'll keep it for a few more years. It's worth doing, but again, the key is to fix things as they wear out, as opposed to leaving a big pile of things, and all of a sudden, it's like a multi-thousand dollar bill, and you go, no, that's not worth it, I'll just junk it. But, a replacement for a Suburban is a lot of money, even a good used one. Mark: Yeah, instead of ... It's a heck of a lot cheaper to spend a few thousand a year than $80,000 or more on a brand new one. Bernie: Well, actually, a hundred. The equivalent of this model, I've seen them in dealerships, it's over $100,000. That's a lot of money for a truck. Bernie: But, if you keep it 20 years and you amortize it out, then that's only $5,000 a year, but you still need the $100,000. It's a lot of monthly payments, or a lot of cash upfront. Whichever way you go. So, a good used one works well. Mark: So, I take back it's a boat anchor. It's just a good used vehicle that's fulfilling its purpose. Bernie: Yeah, yeah. It's not a boat anchor yet. It still works and runs, and it's a good boat hauler. Mark: So, there you go. If you have a boat hauler or trailer hauler, or a people mover, that's huge and needs some maintenance, the guys to see in Vancouver are Pawlik Automotive. You can reach them at 604-327-7112 to book your appointment. You have to book ahead, they're busy. Or, check out their website, PawlikAutomotive.com. There's tons of information on there as well. There's the YouTube channel, Pawlik Auto Repair. Hundreds, literally ... Over 400 videos on there of all makes, models and years of cars and types of repairs and maintenance as well. Thank you so much for listening to our podcast. We appreciate it, thanks Bernie. Bernie: Thanks Mark. Thanks for watching and listening. We love having you as an audience member. Thanks. Mark: Hi! It's Mark Bossert, producer of the Pawlik Automotive Podcast and video series, and we're here Mr. Bernie Pawlik. Pawlik Automotive in Vancouver, Vancouver's best auto service experience, 19-time winners of Best Auto Repair in Vancouver. How are you this morning, Bernie? Mark: We're talking about dash lights. We're going through our little series on explaining what all these funny little lights on dashboards are. We're talking about a 2008 Dodge Grand Caravan and the dash lights. Tell us what all these instrument panel lights mean. Bernie: Sure. Let's just get right into the picture. Though saying it feels like a ... I feel like a broken record sometimes because so many of these icons look the same and they are from manufacturer to manufacturer. If you're watching this series, of course, what's most important is what relates to your own vehicle. This is a 2008 Dodge Grand Caravan. It's a 3.3L gasoline-powered engine, which is pretty much, it's a couple different engine options, but there's no diesel so you're pretty much, I would say the lights in this are probably pretty much the same across the board. We'll start with the red lights. As I mentioned in the past, the reds are the lights you want to take really seriously. They're meant to indicate urgent action is needed. However, I do find there's a couple here that are, at least one that's a little ... could be a yellow in my opinion, and on some cars they are. This light here that I'm circling, this is the airbag warning light. If something is wrong with the airbag system this red light will come on. Obviously, they don't want you driving without an airbag working but it won't affect your performance or drive in any way. It's just that if you get a collision there's a chance that your airbag won't be working if this is on. That's up to you as to what you want to decide to do. These other red lights are certainly to be taken more seriously, many of them. This light here with the body with the seatbelt here, it just indicates your seatbelt's not buckled up. That action can be taken pretty quickly. If you have all your seatbelts buckled up and that light is still on, there's got to be a malfunction in the system. Usually, that's a very reliable light. To the left, we have the battery, this light looks like a battery. This indicates low voltage in the vehicle system. It doesn't actually indicate there's anything wrong with the battery but usually it comes on when the alternator is not charging the battery. When the light comes on, chances are your car's going to be dead pretty soon. I would make my way to the ... as quickly as you can somewhere that you can have the vehicle serviced and repaired because you'll probably need alternator or maybe a drive belt. Sometimes when this light comes on, other lights will come on at the same time. Just be wary that that's something you probably going to need to service soon. If we move to the right here, the oil can light. This is a very important light. This is a red light you would need to take very seriously. This indicates that there is no oil pressure in the engine. Also, of course, the electrical system can malfunction but don't take a chance on that. If this light comes on, check your oil first. If it's full have your vehicle towed in for service, it's very critical. Same with this red light here, this is the temperature warning light. This is another one you really need to take seriously, indicating that the coolant temperature is too high in the engine. On this vehicle, it does actually have a coolant temperature gauge either to the left or right of the speedometer, I can’t remember. You can often verify it by looking at the gauge. If the gauge is, of course if it's high then you need to stop the vehicle immediately and have it repaired, towed in, get it repaired. Up here, this is a brake warning light. Usually, it comes on with the parking brake on. When you release the parking brake, the light should go off. If it remains on, it can often indicate that your brake fluid level is low in the master cylinder, in which case you should have the vehicle inspected. You can look yourself and if you see fluid in there you're probably okay to drive it because it'll come on often when as brakes wear, the fluid will move from the master cylinder reservoir down into the brake calipers. It's not abnormal for the light to come but you should ... your brakes feel fine, have it inspected quickly within a day or two to see why that light is on, because if you're doing a fluid leak, of course, then your brakes will actually, pedal will fail. So it's important to verify what's going on with that. This round light in the bottom, this is a security system warning light. If there's a malfunction in the security system this light will stay on. To the right, this is basically a power loss warning light indicating an issue with the electronic throttle or something that will cause the vehicle to run at reduced power mode. Again, that's a problem that needs to be fixed. There's our red lights. Let's move on to the amber. This is the tire, low tire pressure warning light. If this comes on, first thing to do is inspect your tire pressures. Of course, if you're driving and something feels bumpy or not right, go out and have a look at your tires because you probably have some that's flat. This, again, if all your tire pressures are good and the light remains on then there's a malfunction in the tire pressure warning system. Handy light to have though, because at least you know you're not running on a low tire and you can get it fixed. Low fuel warning light goes without saying, put some gas in the vehicle. This one here, unfortunately, the picture is not to clear but it says ESPBAS. This is a brake assist system, electronic stability programming. Again that's like an issue with the traction control stability programming system. This is also a traction control warning light. If there's an issue with either these systems, this light will come on and needs some service. Same with the ABS brakes. Again, these are all add-on, safety add-ons to your brakes. The stability programming just keeps the vehicle theoretically stable when you're going around corners or making some kind of maneuvers where the vehicle might slip. It just adds a little bit of safety to the vehicle but it's not absolutely critical to the function, so that's why they have amber lights to warn you that something needs to be repaired in that system. Without the ABS brakes working, by the way, the vehicle will still ... should still brake normally, it's just that when you put it on the vehicle could skid. Finally, our last light on the far right is the check engine lamp. This is a very misunderstood light, but it's actually more of an emission system warning light. When this light comes on, there's a malfunction in the engine or computer system that could cause your exhaust emissions to be excessive. It's not a warning that your engine level is, oil level is low, although sometimes low oil level can cause this because it's a variety of things the oil level can cause. If the light's on solid, take it in for a service soon. Soon meaning anywhere from same day or a week or two if it's running fine. If this light is blinking, however, that indicates immediate need for service because the engine has a misfire that could damage the catalytic converter and cost you more money. Blinking light, get it fixed right away. If it's just on solid, get it fixed soon. That goes through our entire 2008 Dodge Grand Caravan instrument warning light. Mark: The check engine light, I'm sure that's caused you more concern than it really should've because there are so, so many ways that that can be triggered. Everything from not having the gas cap on to, you name it, there's many things. It becomes really difficult to diagnose at times, is that correct? Bernie: There are times it's difficult to diagnose. There are literally hundreds of things that will cause that light to come on. As you said, the gas cap is often the simplest thing. If it does come on, check it, just loosen your gas cap off, tighten it, if it's really loose then that could be why the light was on. That's usually the simplest thing, but there are just a variety of different things. Sometimes, interesting enough, an engine could actually be running rough where clearly the exhaust emissions are out of whack or they would be out of whack and the light doesn't come on. I'm scratching my head go, "Why would that be?" Anyways, there are a lot of reasons for that light to be on, but, most importantly, when that light comes on, if the engine's performing well like it's running seems seemingly normally, it's not urgent to fix it. You should have it looked at but it's not ... you don't need to panic and freak out. If it's blinking, as I said, you got to fix it right away. Mark: There you go. That's our little walk-through of the warning lights on a Dodge, the dash lights and the warning lights therein on a Dodge Caravan 2008 vintage. These lights will apply across most years of Dodge Caravans, is that right? Bernie Pawlik: Yeah, they will, at least around this vintage of van. This is that square boxy style caravan. I can't remember what year they started doing that, but I think '08 is early in that vintage. Again, with your own vehicle as I always say, get get your owners manual out, have a look, but if you're looking at this video or podcast, have a look at the ... have a look at how this compares to your dash. If it's the same then take all our advice we're giving you here because it's all there. Mark: There you go. If you need some service on your vehicle in Vancouver, the guys to see are the Pawlik Automotive. You can reach them at 604-327-7112. You have to book ahead to have an appointment because they're busy. Two service advisors to help you out at all times as well. You can check out their website pawlikautomotive.com or our videos on Pawlik Auto Repair on YouTube, hundreds of videos on there, all makes and models of cars as well. Thank you so much for listening to the podcast. Thank you, Bernie. Bernie: Thanks, Mark. Thank you for watching. We really appreciate it. Mark: Hi, it's Mark Bossert, producer of the Pawlik Automotive podcast and video series. We're here with Mr. Bernie Pawlik, Pawlik Automotive in Vancouver, Vancouver's best auto service experience. We're talking about a 2008 Dodge Grand Caravan this morning, that had a coolant leak. What was going on with this vehicle, Bernie? Good morning. Bernie: Hey, good morning. This Dodge Caravan actually had a very large coolant leak coming from the back of the engine. Well, in between the engine and the transmission. Pour some coolant in, and it would be dripping out almost as fast as you could pour it in. Not quite, but, almost as fast as. So, yeah, there was a very major leak coming from this engine. Mark: So after you dried your shoes off, what was causing such a large leak? Bernie: What we found, what I suspected, and it actually involves removing the engine from the vehicle to verify it, was that there was probably a frost plug that had failed. It didn't take long ... soon as I removed the radiator cap, note right away there was a lot of rust on the radiator cap, and sitting in the top of the radiator. The owner of the vehicle had told me that they'd recently replaced the radiator, and so something that ... it wasn't even an old radiator, had rust in the coolant. To me, suspicious immediately of ... it's probably a rusted out frost plug. Mark: What is a frost plug? Bernie: What a frost plug is, it's also known as an expansion plug. 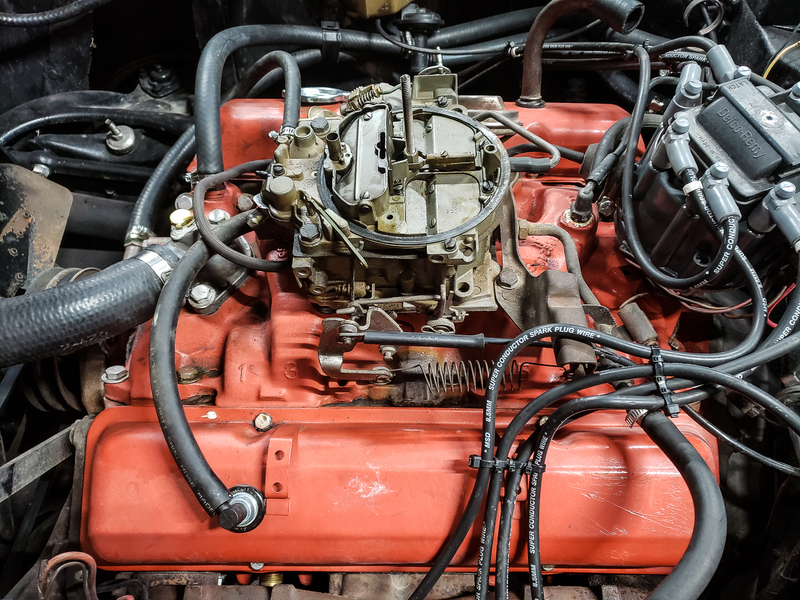 They put them in the engine block, the purpose, one of the purposes, supposedly, is to prevent ... if you had water in the cooling system, so this goes way back to when before antifreeze was invented, or used. If you had water in the cooling system, of course, when it gets cold out, water freezes and it expands, and as it expands, of course it'll crack the metal of the engine block. If you put these plugs in, these frost plugs or expansion plugs, these plugs are supposed to be pushed out by the expanding water, and prevent the block from cracking. In reality, that usually doesn't work. I've had many vehicles in the past where people have had water in the cooling system, it freezes and cracks the engine block. They don't actually work like they're supposed to, but they also do, apparently, hold the casting ... when they cast an engine block they actually hold some of the molds in place as well, so that's another reason, apparently, for having them, although I've never actually been in a foundry and seen a block cast, but that's another purpose for it. Nonetheless, they need to be intact. They're made of ... they're generally a metal plug made of a thin, maybe 16th inch think, millimetre thick piece of metal that's hammered, it's hammered and friction fit into the engine block. They are susceptible to rusting out. Mark: Why had this frost plug failed? Bernie: Bad maintenance. Clear and simple. Bad maintenance. And by the way, this part, a frost plug is worth about a dollar, just to put things in perspective. The labor involved in replacing it is huge. Let's just go into some pictures right now. Basically bad maintenance is what caused it. The owner had probably, it's a 10 year-old van, probably should have the cooling system flushed at least once, maybe twice in this age of vehicle, and I would suspect never had it done. Maybe there's a coolant leak at some point, they let it run with some water in it for a while, and it's a cast iron engine block, so it will rust up. We're getting some pictures. So there's the 2008 iconic Dodge Caravan, or popular as you would say. There's our first sign, before I even did any repairs on the vehicle, you can see the rust in the cooling system. That's a sign, right away, that there's a fair amount of rust throughout the cooling ... it never just stays in one spot, once it develops it tends to circulate around. There is a first telltale sign. What's involved in this repair, is actually removing the engine and transmission from the vehicle, because it was leaking ... this is the bell housing area where the transmission bolts to the engine, and this is the rear frost plug. There's two of them, one here, one there. This is a cam shaft plug. This actually seals off an oil passageway. But there, where red arrow points, is a little hole that basically developed from the frost plug leaking out the coolant. When we look a little further, this is what the frost plugs removed ... and this is the kind of guck that was inside the back of the engine, the rust and corrosion. See, this is the back of the cylinder walls, these two areas, and this is just rust that had ... I stuck my fingers in here and dug a bit of it out, but that's basically the mess that was inside there. In doing the service and repair I have a special flushing tool, and flushed all of it out. Still, once you develop this kind of rust, it's impossible to get rid of it all, but I probably removed about 95% of it in the process of doing this work. Just to look at things in perspective, after flushing out some of the heater hoses, this is what the coolant looked like. That's not yellow antifreeze, there are some antifreezes ... there are some antifreezes that have this colour, but this is definitely rusty water. So there's our picture show. Mark: Basically, just from not flushing the coolant system, that would cause this much rust and damage in the interior of the engine? Bernie: Yeah, as I said, my suspicion is that it may be that they ... well, first of all, it definitely didn't get flushed and serviced as much as it should've; and there was probably a time where it may have been low in coolant and the people had just put water in it for whatever temporary reasons. Maybe the temporary reasons were six months or a year, but between the two of those things, that's how the rust developed. I actually purchased this vehicle from the owner. They didn't want to spend the money repairing it. So, essentially, they've taken a very good Dodge Caravan, with pretty low mileage, 150,000 km, and basically that vehicle is, to them, just junk. It's a shame, because one or two coolant flushes and some good maintenance, would be $200, $300. Not a lot of money. Yet, now they're out buying another vehicle. It really does pay to do your maintenance, especially ... if they'd paid for this repair, could be $3000 to $4000. Still worthwhile with the age of the van. It was otherwise in pretty good shape. Again, $300 or $3000, you know. As the Fram guy used to say, "You can pay me now, or pay me later." It's a classic example. Mark: How often, other than too often, how often do you see these expensive repairs from lack of maintenance? Bernie: From time to time we get vehicles in, and most of the times it's from people who haven't changed their oil enough, and the engine's just ... something's just blown up inside the engine. In all fairness, sometimes things blow up even for people who maintain their car well, but it's more often the lack of maintenance that causes these problems, or things that sludge up inside the engine, timing chain problems, rattles, cam gears. It's so important to change your oil and fluids regularly on modern cars. You don't need to do them as often as you did in the old days, I'm thinking 20, 30, 40 years ago, but with modern cars it's even more critical to do them when they're due or even sooner, just to ... it saves you a lot of money. Mark: And Dodge Caravans have had a mixed, let's be kind, a mixed reliability record. Some years are pretty problematic with transmissions, and engines, depends on the motor. How is this generation of vans? Bernie: These are pretty good. We don't see a ton of problems with them. It's been interesting ... with this engine I not only replaced the frost plugs, but I took the engine ... it had a couple of oil leaks, and I figured while the engine's out I may as well just re-gasket the whole engine, including the head gaskets, because you never know how hot this person got the engine, and I don't want to sell it to someone and find the head gasket's blown a month, or even a year. Bernie: It's actually an incredibly simple engine, so there's not really a lot to go wrong with it. For reliability, the transmissions are definitely better than they used to be. Overall, they're actually a lot better than they used to be. Mark: So there you go. If you're looking for maintenance and/or repairs on your Dodge Caravan, the guys to see in Vancouver are Pawlik Automotive. You can reach them at 604-327-7112 to book your appointment. You have to book ahead, they're busy, or check out their website pawlikautomotive.com. Hundreds of videos and articles on there about all makes and models. Of course, on our YouTube Channel Pawlik Auto Repair, same idea, hundreds of videos on all makes and models and types of repairs. Of course, thank you so much for listening to the podcast. We appreciate it. Thank you, Bernie. Bernie: Thanks Mark, and thank you for watching and listening. Mark: Hi. It's Mark Bossert, producer of the Pawlik Automotive podcast and video series. We're here with Mr. Bernie Pawlik of course, of Pawlik Automotive in Vancouver. Vancouver's best auto service experience and 19 time winners, 19 times voted by their customers as Best Auto Repair in Vancouver. How are you doing this morning Bernie? Mark: So we're talking about a Subaru Impreza today, a 2009. It was an AC compressor issue. What was going on with this Subaru? Bernie: So this vehicle came in with basically the belt drive in the AC compressor was gone and the compressor pulley was seized up. The compressor pulley bearing had failed and caused the belt to basically burn off. Mark: And there was no belt there at all? Bernie: No. No belt there at all. Bernie: The belt is always turning with the engine running and the compressor pulley of course is always being driven. The compressor does switch on and off with the clutch but the actual pulley's always being driven. So if that seizes up belts will break. Mark: So this Impreza was driving around with its pants down basically? Bernie: Yeah. Kind of, yeah. I mean it drives fine without the belt on because the belt only drives the AC compressor which is a good thing in that respect. It doesn't affect the rest of the vehicle but the AC was no longer functioning. Mark: So what kind of repair needed to be done on this? Bernie: So basically the compressor needed to be replaced and I'll just get right into some pictures here so we can have a look at things. But yeah, basically the compressor needed to be replaced to solve the issue, and the belt of course. So this is our old compressor here, the original compressor with both drive belts off. This is the alternator over here. And the red area basically point to the ... You can see a sort of burnt area here. This is basically the compressor clutch assembly and this pulley here which rotates at all times with the engine running, it basically seized. You couldn't turn it. And unfortunately I didn't get a video capture of it but is you stuck your hand on that pulley you would be able to wobble this thing back and forth. It was very loose so the bearing had basically worn out. It was very loose and of course caused this all to fail. At one time you could buy just the compressor clutches for vehicles and replace them. And if you did enough digging you could probably actually, possibly come up with a bearing replacement but usually at least by this point it's probably damaged the clutch pretty badly running loose. So you'd want to replace the whole thing at this point. But sometimes if you have a bearing in early stages of failure you can replace it, but those parts are getting very hard to find nowadays. It's kind of replace the whole assembly type of thing which happens a lot in modern car repairs. This is our new compressor mounted. You can see it's much shinier and clean so this is what the ... The hoses are not attached to the system but that's basically the belt installed and new compressor put in place. Mark: So, is this a large job? Bernie: As far as air-conditioning no. I mean labor-wise it's not particularly difficult to do but it does involve of course evacuating the air-conditioning refrigerant and then recharging the system afterwards. But as far as actual component replacement it's one of the easier items to do on an air-conditioning system. I mean the evaporator is definitely the worst because that's located behind the dash and you have to tear the whole ... generally you have to tear the whole dash out on 99% of cars. There are a couple where you don't but yeah, 99% of vehicles you have to tear the whole dash apart to get the evaporator. So this is a pretty easy job to do. The parts are generally not that cheap though so it does end up being a pricey repair but it's not too difficult labor-wise. Mark: And is this a fairly common failure on Subarus? Bernie: Not particularly. I mean any vehicle, these bearings will fail but it's not an everyday failure item we see. Certainly not as predictable as head gaskets are on these cars. Mark: And would the car owner have any warning prior to the failure? Bernie: Yes. Normally you would. You'd normally hear a sound coming from the engine. There'd normally be some sort of grating sound, a grindy sound. As so sometimes it can be a little subtle but normally you should be able to hear something and certainly before the belt failed it probably made some very loud screeching noises. But by that point it's definitely too late. Mark: So it's winter now in Vancouver which means no need for air-condition. Would it have been possible to have left this repair for warmer weather? Bernie: So in this particular car, certainly you could have because as I said, the compressor's driven by its own belt. If you have a vehicle with a serpentine belt and that's a belt that drives all the components you really can't do that because you have to have that piece in there. Some cars you can actually get a shorter belt or an auxiliary pulley but it doesn't really make sense to do that for the most part. So the answer is, yes you could have left it but one thing about air-conditioning it actually provides an awesome defrosting function it's really just as useful in winter as it is in the summertime. I mean in the summer you want it to keep you cool but in the wintertime air-conditioning dries the air so it will defrost your windshield extremely quickly. And it's very noticeable if you have a car where you can turn the air-conditioning on and off with the defrost or triad you'll see just how effective having good working air-conditioning is. It will defrost your window very fast. Bernie: Defog it, yeah. Exactly. Not frost. We say the word frost. Yeah, defog, get the fog off the inside of the windscreen. So yeah. It makes a huge difference and that's really a safety feature having that. And it actually saves you on fuel because you could sit in front of your house and turn the heat on for 10 minutes and then you've wasted a bunch of gas. But if you turn your air-conditioning on, one minute later its defogged and away you go. So it's a good thing to have working year round. And of course as it cycles year round it keeps everything moving and it actually keeps the components lasting longer than it would at other times of the year. Mark: So there you go. If you have a Subaru in Vancouver and you need some maintenance or some repairs the guys to see are Pawlik Automotive. You can reach them at 604-327-7112 to keep your windows fog-free or any other kind of repairs or maintenance. You have to call ahead to book because they're busy, unlike many other shops. Or else checkout our website pawlikautomotive.com, our YouTube channel, Pawlik Automotive Repair, hundreds of videos on there on all makes and models and types of repairs as well. Thank you so much for listening to the podcast and thank you Bernie. Bernie: Thank you Mark and thank you for watching. We really appreciate it.